In the first post of this series we added our own custom checkout fields, in the second post we customized Order Details metabox in admin area. Today we’ll add order custom fields to user pages: Order Received page and View Order page in My Account. Below is the example of additional fields on the My Account > Orders > View Order page with active Storefront theme. woocommerce_view_order action hook is for the View Order page, woocommerce_thankyou is for the Order Received page. The code for your functions.php below. If the order is not marked as a gift, the Gift Wrap, Recipient name and Gift Message fields won’t be displayed. 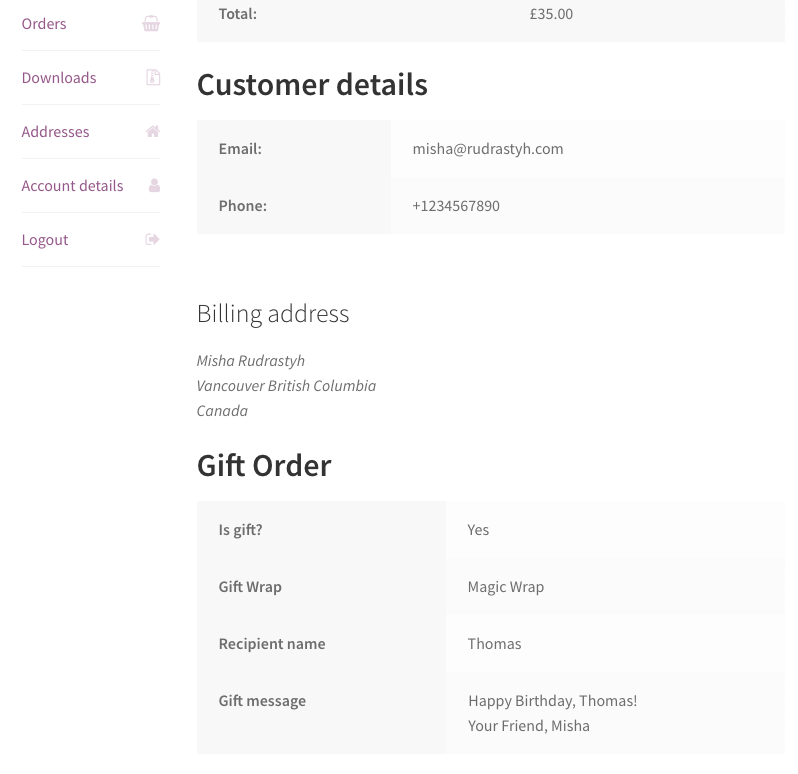 I Have read your tutorial about ” Additional Order Details on the “View Order” and “Thank You” Pages'” and I would like to do it with the billing address and shipping address on the ‘woocommerce_checkout_before_order_review’ ( I’m using a multistep checkout plugin). Sorry, I’m not sure what page do you mean. Could you send me a screenshot of the page please? I want to show just under “adresse de facturation” (billing address) the billing address of our customer. Not the form but a recap of his billing address and shipping before he orders.